Supernatural returns to the alternate universe for a rescue mission as Lucifer struggles to maintain control of Heaven and Sam works to help Gabriel along with Castiel. We’re on the final stretch of the season now which usually means that the plot starts to ramp up. This episode is an example of the writers starting to line things up in preparation for the season’s end game though it is still unclear where this season is actually heading as there are a few plots that don’t feel entirely connected. The one that feels like it will end up having the most significance is the alternate universe story. The alternate version of Michael has been repeatedly shown to be a threat to both worlds now that he knows about the accessible unspoiled universe that he can conquer. Michael doesn’t appear in this episode but reminders of his influence on the other Earth are abundant suggesting that he will return in a big way fairly soon. He certainly won’t have given up on crossing over and I’d be surprised if he doesn’t end up doing so by the end of the season. I’m not sure there’s time for him to do that and be dealt with in a way that would be satisfying but it certainly seems to be where the story is heading. Perhaps Michael will be the main antagonist for next season. Dean and Ketch’s trip to the other Earth is ultimately fairly worthless as they make very little progress. They don’t manage to help Mary and Jack nor do they really learn anything of significance. This episode was actually really clever in approaching the story on the other Earth with Dean and Ketch being deposited in a random location and having to find their bearings. It’s a nice reminder that the alternate Earth is still a massive world and there’s no guarantee that the portal will get them anywhere close to where they need to be. In this case they don’t so they spend a good portion of the episode wandering aimlessly trying to figure out their next move. The only lead they get is when they witness the capture of the other Earth’s version of Charlie who is the member of a resistance group trying to stop the Angels. Part of the fun of alternate universes is that different versions of characters we already know can be introduced. This version of Charlie is far more hardened than the traditional version was which suits the world she lives in but the compassionate nature and innate desire to do good is still within her. The most striking thing about her is that there really aren’t a lot of differences between her and the Charlie that Dean knew. Her presence is also distracting because Dean doesn’t accept that she’s a different person. In his mind Charlie was someone he cared about and he can’t turn a blind eye when an alternate version is in danger because he sees them as being the same person. The excuse he gives to Ketch is that she clearly knows something about Mary and Jack so she is their best chance of finding them but he definitely has a personal stake in rescuing her. He eventually admits that when Ketch does enough prodding. Dean opens up about how deeply the loss of Charlie affected him. She was like a sister to him and he feels like he failed her by not getting there in time to save her so having the opportunity to help this version of her feels like a second chance in a sense and he refuses to fail her again. As far as he’s concerned the fact that she’s technically a different person is irrelevant because he can’t just turn his back on someone he cares about even if it isn’t the person he knew. 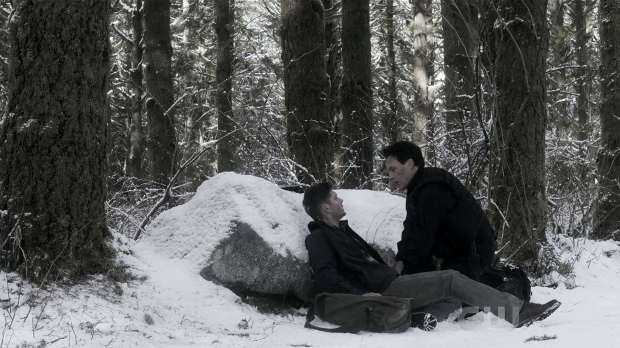 Ketch is predictably pragmatic, seeing Dean’s attachment to someone he actually doesn’t know as a weakness and pointing out how grim their situation actually is. This detached attitude is in keeping with his character and offers an effective counter to Dean’s passion driven outlook. He does come around to Dean’s way of thinking after he opens up and realises that his detached approach might not be the best way to live. A major difference between them is that Ketch fights out of duty where Dean actually finds things to fight for and that important difference defines their attitude. Ketch has turned his back on his own humanity but manages to admit that he’s also lost people close to him and deep down he is looking for some form of redemption. Saving Charlie could be the first step towards finding that so he agrees to do things Dean’s way. As always Dean and Ketch make for a really formidable team. Their quick take down of all of Michael’s loyalists is both savage and efficient showing the complimentary skill level of both characters and their military precision when it comes to taking down opponents. It’s something I would definitely like to see more of as they make for a good team in pretty much every respect. Dean meeting the alternate Charlie is really brief and lacking in any real depth. They have a brief discussion where Charlie gets her head around the idea of alternate universes before they part ways because Charlie feels that her place is on her own world and that she has a responsibility to continue trying to fight it. 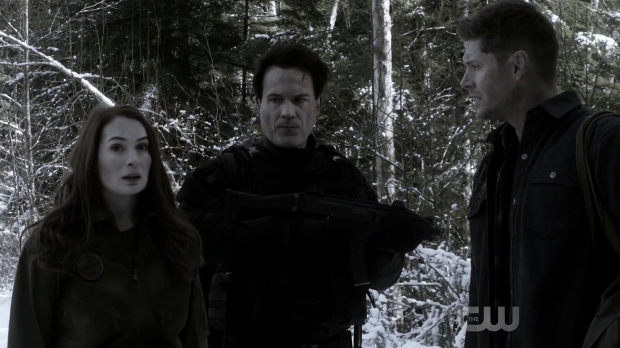 Ketch also stays behind to assess the situation while Dean finds reinforcements. When Dean returns to “our” world he hears nothing but bad news when he learns that there’s no way to go back. His reaction takes him back to when he was depressed and defeated earlier in the season. The realisation is multi layered as he considers every time a situation turns sour; lamenting the fact that it always happens to them. It almost counts as a meta gag as the writers often escalate situations through failure when approaching the end of a season. It’s a natural way to create drama but to have over a decade of this happening to the same people would take a toll and Dean is reaching the end of his terror. It could be a really dark few episodes for Dean leading up to the end of the season based on his outburst here. Sam and Castiel task themselves with taking care of Gabriel and it’s fine as plots go. At first Gabriel is characterised as a torture survivor with an extreme case of PTSD. He chooses to communicate through writing his story on the wall which answers the question of how he survived even if it’s unnecessary to do so. This part is definitely the strongest as it allows Sam to play to his strength by showing him compassion and offering him the help he needs. Ultimately it works and Gabriel accepts his assistance. The drawback to this is that Asmodeus is alerted to his location and stages an assault on the bunker to retrieve him. This completes Gabriel’s arc towards recovery as he faces his torturer achieve catharsis through revenge. I must say I’m surprised that Asmodeus was killed though I’m also glad as I never found the character all that engaging or threatening. This supports my theory that Michael will replace him as the main antagonist as this seems to be removing him to make room for that. Gabriel’s arc wasn’t technically bad but it was problematic in how rushed it is. He is an archangel so trauma may not affect him as it would a Human. Even if that is to be the case then the whole thing still feels very abrupt though his reluctance to step in and help does make sense as the whole point of his character was turning his back on the Angels because he wanted no part of it. There is also a declaration of confidence in the Winchesters as he trusted that they would succeed before. Lucifer is having his own problems controlling Heaven. He has made finding Jack a priority but doesn’t realise that the Angels don’t have the manpower to effectively mount a search nor does he realise that Jack isn’t on that Earth at this point in time. Lucifer’s desire to forge a relationship with his son is an interesting one as it’s unclear whether he genuinely cares for him or has some other agenda. Based on what we know about Lucifer so far it’s just as likely to be bother. Another issue he faces is that the Angels don’t respect him because he doesn’t give them a reason to. He rules them with an iron fist with only fear inspiring their loyalty which is very different to how God would run things. Anael is the only one brave enough to call him out on that. We know from her previous appearance that she seems committed to helping him achieve her goals out of her own sense of self preservation while clearly manipulating him into doing exactly what she wants. We see more of this here when she exploits his vulnerabilities and tells him what to do. Her tone is harsh as she encourages him to act like God if that’s how he wants to be seen. He does this by listening to prayers and being instantly disgusted as he sees it as weak Humans whining about their lives. The one piece of intervention he does is freeing a possessed girl from a Demon. It’s a hilarious scene made better by how casually the Demon is expelled. 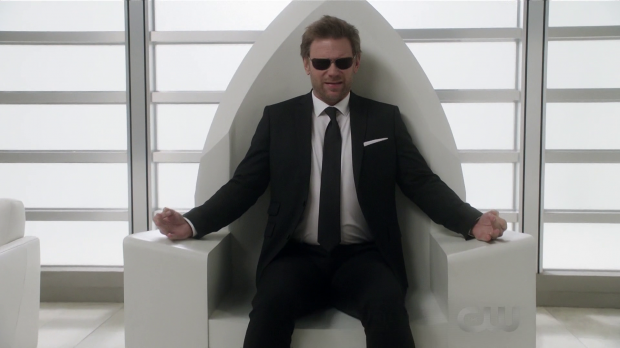 Mark Pellegrino’s performance as he tries to make the priests understand that he isn’t as bad as God’s propaganda suggests. Lucifer’s arc at the moment appears to be centred around his growing self awareness. He is paying more attention to how others see him whether that be Angels or Humans and appears to be trying to change that perception but has no idea how to do it. Anael further shows how skilled she is in the art of manipulation when she pushes him too far causing him to react violently followed by her walking out on him. By doing that she cuts him off from the only support he has which will likely result in him begging her for forgiveness. Once again Anael’s ability to make Lucifer do exactly what she wants him to makes their relationship really interesting to watch. A great episode that makes strong use of engaging character dynamics to further the various plots. 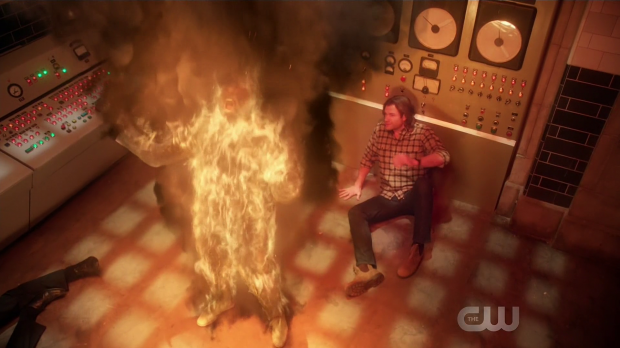 Dean and Ketch always make an engaging team and their debate over whether the alternate Charlie is worth saving is revealing for both Dean and Ketch. They manage to agree on the right thing to do for their own reasons and insight is given into Ketch’s approach to loss and how that might need to change. Their savagely efficient take down of all of Michael’s loyalists is an excellent sequence showing the equal skill level of the two men. Dean’s return to “our” Earth comes with the realisation that the trip was nearly pointless which causes him to react very angrily because he’s sick of failure. This could signify a darker path for him going into the final episodes. Sam’s attempts to help Gabriel are well done but his arc towards recovery is very abrupt. I like the idea of him facing his torturer and overcoming him but it feels unearned because it happens so quickly. His subsequent departure is significant and in keeping with the character as he removed himself from the Angel situation long ago for a reason. Lucifer’s control of Heaven isn’t going well for him because the loyalty only exists out of fear so it isn’t genuine. Anael challenges him to be more like God causing him to try answering prayers but ends up disgusted at Humanity’s whining. His Demon exorcism is a hilarious scene and suggests an arc where Lucifer cares about what others think of him and wants to change how he is perceived. Anael is as casually manipulative as she was before and it’s great to see.